Posted on June 1, 2016 at 2:32 pm. You are happy enough playing at an online gambling site and earning free spins on a pokie, but Rizk Casino has taken it to the next level, allowing you to exchange these giveaways with Super Spins and Mega Spins. Since the launch of the casino a few months ago, Rizk has gained a hefty following. To celebrate, the online casino wants to reward players by offering a Free Spins Exchange where players can swap standard free spins for Super Spins and Mega Spins. Super Spins are worth $1 per spin, while Mega Spins are worth $3 per spin – both are much more valuable than standard free spins. You will need to contact the support staff at Rizk in order to take advantage of this offer, and you can do so by emailing your full name and username to [email protected] after you have signed up. If you don’t have any free spins yet, there’s a few ways to get them – the best way by being a new player. If this is the case, follow our links and register an account with the online casino and opt in for the welcome bonus of $100 matched by 200%. This gives players up to $200 in bonus cash to play with, and increases a bankroll that started at $100 to $300. 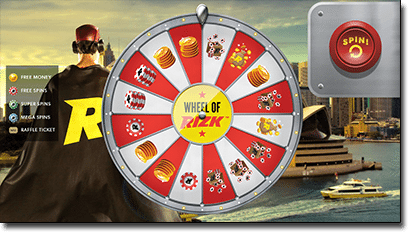 You will also be given a free spin of the Wheel of Rizk, which offers the chance to win a minimum of 10 Free Spins. You could end up with other prizes such as cash, raffle tickets, Super Spins, or even Mega Spins, which wouldn’t be so bad – but avoid the skull as you win nothing if you spin it. Then you will need to get playing your favourite casino games in real money mode to earn more spins on the Wheel of Rizk, and in turn Free Spins. The Power Bar will monitor your progress and as you fill it up by playing real money casino games at this website, brought to us by the same people who developed Guts.com. Rizk also regularly holds promotions where players can compete to win a set amount of Free Spins, so if you score these you can then exchange them for the better spins. Read enough? Sign up at Rizk Online Casino and receive a 200% deposit bonus up to the value of $200, plus gain access to an exciting and fresh gambling website. Or read a full review of Rizk Casino. If Rizk doesn’t accept players from United States, we recommend you head to Raging Bull Casino which is one of our top rated casino sites for players from United States.